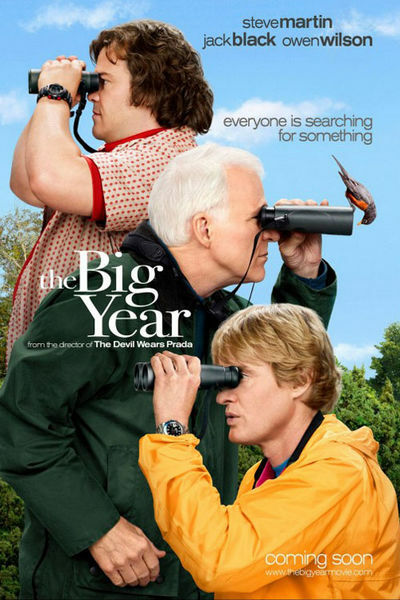 The publicist for "The Big Year" movie is generously offering Salt Lake area readers of "Birding is Fun!" an advanced screening on Monday, Oct. 10 at 7:00pm at the Megaplex Gateway theater. I'll be there with my non-birding-bride. Won't you join me! Oh...and the passes are absolutely FREE!!! Please note this screening is first-come, first-serve and these passes do not guarantee people a seat at the theater. So please ARRIVE EARLY! The box office opens at 4pm and people can start exchanging their screening passes for tickets at this time. You will have to create an account at Gofobo and enter the RSVP code of BIRDG5B77. Please do not reserve more tickets than you actually need and if you're not going to use them, please go back to the Gofobo website and cancel your RSVP. Wish I lived nearby! What fun! @Jean @KaHolly - I feel very fortunate that the movie publicist would provide this opportunity. It's going to be lots of fun! Why don't you both fly into SLC for the showing?! That's quite an honor! Hope you enjoy the movie! I'll be reading the book while camping and then see the movie on the 14th.